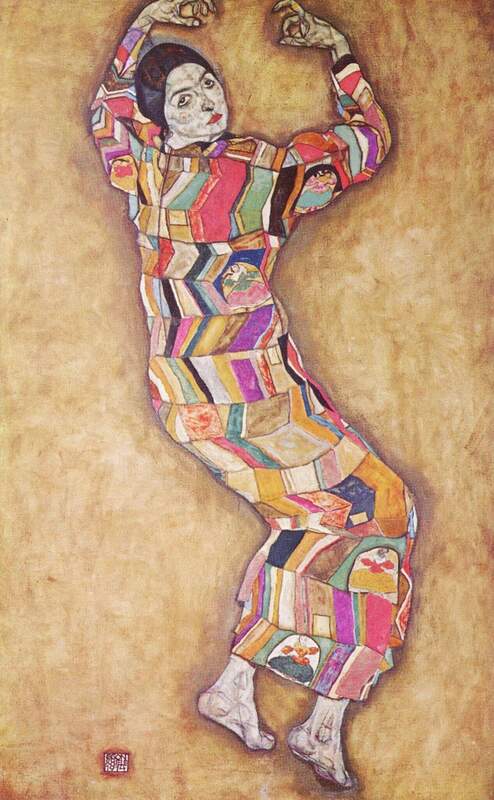 Egon Schiele was an Austrian painter and protege of the Austrian symbolist (and lover of the female body), Gustav Klimt. Schiele is most famous for his twisted bodies, hyper sexualized sketches, grotesque, and almost endless self-portraits. He is considered an early expressionist painter who leans toward figurative painting. Figurative art is considered to be drawn from actual objects or persons – therefore it is representational rather than based in imagination. Expressionist painting allows the artist to transform works based solely on emotion and subjective perspectives and distortions – often these works are not in the realm of “the real”. Technically speaking an expressionism painting and a figurative painting are at odds with one another – one aims to be wholly based in “fact” and the other in “feeling”. This dichotomy adds a layer of beautiful confusion to Schiele’s paintings. They slept, recovered from beatings administered by parents, lazily lounged about – something they were not allowed to do at home – combed their hair, pulled their dresses up or down, did up or undid their shoes … like animals in a cage which suits them, they were left to their own devices, or at any rate believed themselves to be. 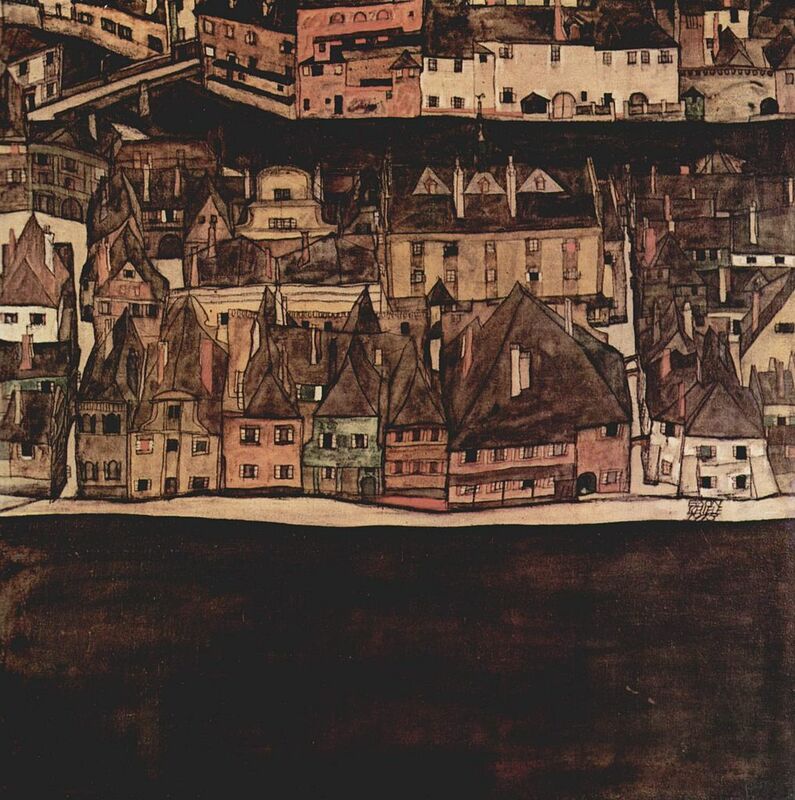 Schiele died at the tender age of 28 – three days after his six months pregnant wife died from the Spanish Flu Pandemic. During his mere 28 years he created about 3,000 works on paper, and a few hundred on canvas. 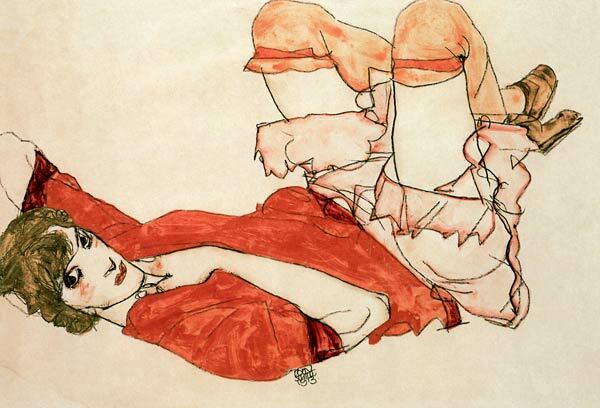 It is said that much of Schiele’s success was because of the shocking and disturbing quality of his drawings, including: shortened or absent limbs, women exposing themselves indecently, presentation of self-angst and self-pity, unexplained personal symbolism, and impossibly positions bodies. Although most of his paintings focus on flamboyant and wanton people – the one below shows a sense of calm (and still life) not typical in his repertoire. The oil is layered on thickly and swiftly. The color is bright compared to many of his works. The angle and flatness is definitely reminiscent of Van Gogh’s Bedroom in Arles. But above all, it actually seems cheery, still, and almost peaceful. 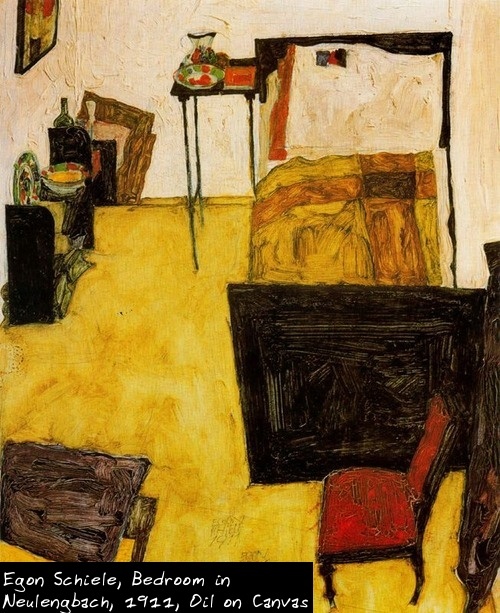 This is what Schiele’s bedroom meant to him – a bedroom he escaped to from the city – where he slept with model and lover Wally. Schiele was working in the time of Art Nouveau – a style characterized by geometric shapes, sudden curves, decorative molding, and ornate patterns. 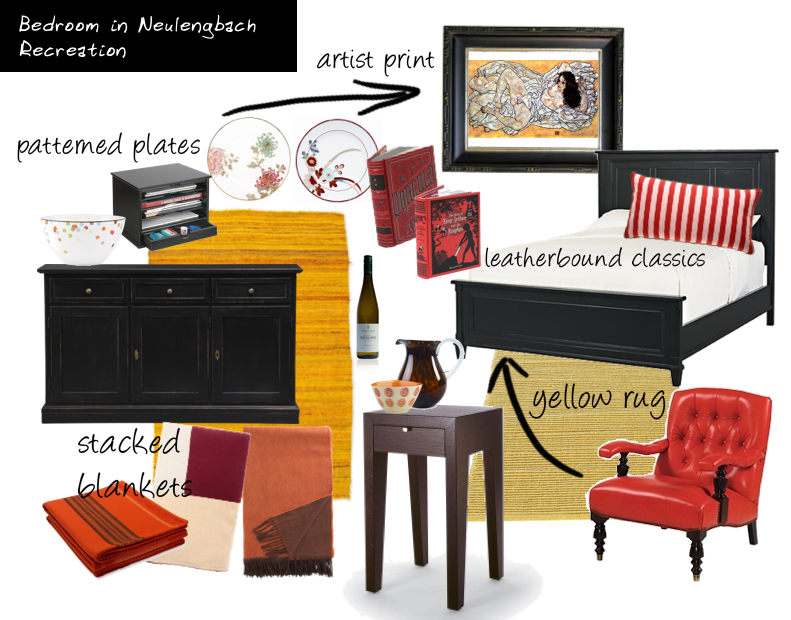 This can be seen in the red chair in the artist’s room, and also in his personal affects: patterned bowls, curved black pitcher, geometric bedspread, square bed, and dotted plates. How to recreate this today? See below! Red Leather Parlor Chair (front right) – Flores chair, $2,999, eliteleather.com for stores. To learn more about Egon Schiele page, visit Artsy which provides visitors with Schiele’s bio, over 25 of his works, exclusive articles, as well as up-to-date Schiele exhibition listings.